The Purple Stained Glass Studio: Bonnie Brooksbank Welcomes You. 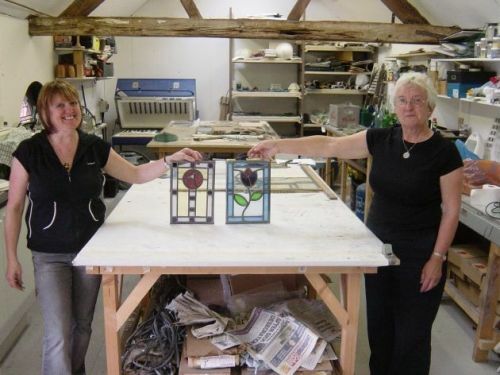 Designing, making and restoring traditional and contemporary stained glass, leaded lights, and fused glass. Encapsulating leaded lights into double glazed units. I also run a variety of workshops teaching all of the techniques used in my work. When my family bought me a course in stained glass making I didn't expect it to change my life! Bonnie, my one to one mentor, is passionate about her craft and enthusiastic about imparting that passion to anyone who enters her world of glass. Bonnie has a personality that is warm and giving, important when you work closely with someone. If you get the chance to enter the Purple Glass World......DO IT. I thought I would write to let you know how delighted we are with the encapsulated leaded light window you made for us recently. The leaded window detail has been restored to its original splendour and has been worth every penny. It looks great. Just a note to say a big thankyou for the superb job you made of our 1938 leaded lites - now back in their rightful positions courtesy of Mick Tuckey. We love them and they have been much admired by our friends and neighbours." I really did have a great time with both you and Claire, you are very patient and explain things clearly in simple terms (just like me)." "Bonnie is so much into glass she's see through, but she has hidden depths!"